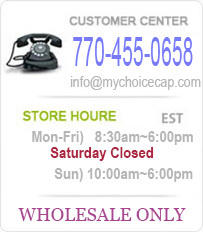 We are a cap wholesaler. We offer our products at rock bottom prices with most items not requiring a dozen purchase. There is a $100 minimum order. The order minimum applies to subtotal and not total price with shipping costs. We accept visa, mastercard, discover, and paypal. All information is kept secure and private and deleted and destroyed once order has been shipped. We do not keep credit card numbers on file for security purposes. You are protected by the latest ssl encryption technology on all secure transactions. We do not charge your order until it has been shipped. In the event your card declines, we will call you for alternate payment methods. We do not accept checks, and do not do C.O.D.'s. We try our best to keep our website as accurate as possible. There may be times we are out of stock of your design or specified color or size. We constantly restock and get new designs in every week. In the event an item is out of stock, we ship whatever we have and charge same amount what we ship. We are a wholesaler and most clients just accept replacement of a similiar design. So we may substitute some items to complete your order with like or similiar products when customer choose substitute option. If you MUST have specific designs, colors, or sizes, please contact us or leave a note stating this. We kindly ask our customers to place orders online which is available 24 hours a day. Our time and resources are limited at times, and we need to devote our phone lines to customer service issues and questions. Ordering online has many benefits including convenience, security, stored account information, and accurate pricing and shipping. A $5 handling fee is applied to all orders. Operating hours are as follows.